Outset Scotland is delighted to have supported Open Glasgow 2014, Glasgow International’s commissioning fund for Glasgow-based artists to realise self-generated projects. 2014 selected participants included Laura Aldridge and Anna Mayer, Fiona Jardine, Opera Autonoma collective, The Burning Sand, Seth Orion Schwaiger and The Chalet Archive, and Hardeep Pandhal. Working collaboratively, Laura Aldridge and Anna Mayer designed and constructed a portable ceramics kiln which was the focus of three themed firing events around the city. Local artists and practitioners were asked to contribute a performance or offering to these public gatherings, with an emphasis on sociality and an exploration of how the art making process can be both ritualistic and casual. Fiona Jardine’s new work, Spark for Artists was an illustrated presentation that explored the role of art and artists in the work of Muriel Spark. Connections were made between motifs in Spark’s work to Elizabeth Price’s recent films, the Artist Placement Group and Arthur Danto’s appropriation of the title of a fictional text from The Prime Of Miss Jean Brodie, amongst others. Directed by Craig Mulholland, the artist’s collective Opera Autonoma produced multi-disciplinary artwork GYMNASIA. 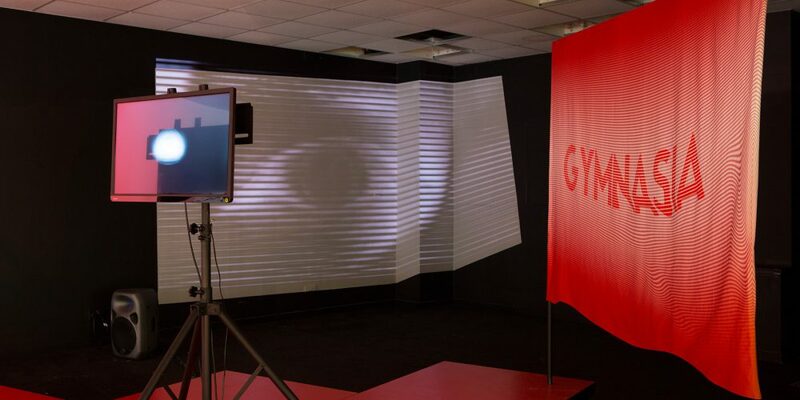 Inspired by the non-hierarchical alignment between physical exercise and scholarly activity found in the ancient Greek institution of Gymnasia, it functioned both as a live performance event and static multi-media installation. Prose, poetry and art magazine The Burning Sand celebrated the publication of Volume 3 on the closing weekend of the festival. This free event included DJs and live performances by Glasgow-based artists Kathryn Elkin and Lauren Gault. After a period of rest, The Chalet reopened with an exhibition and archive launch, curated by Seth Orion Schwaiger. Sehnsucht presented artists Lola Dupré, Elizabeth McDonald, John Nicol, Carla Novi, and Gaby Peters. The artists were selected from the Chalet Network for their work’s intrinsic relation to the German term Sehnsucht (yearning) and the term’s pertinence within their own often nomadic existences. Recipient of the Glasgow Open Bursary, Hardeep Pandhal’s new project investigated the history and visual identity of the coffee substitute brand Camp Coffee. From his position as a British man of Indian origin, Pandhal re-imagined the characters on the company’s logo and their shifting colonialist reading.